Depending on where I’ve eaten most recently, I’m liable to label any one of Dosa n Chutny, TAYYABS or JAFFNA HOUSE the best curry house in London. They’re all delicious, affordable and worth writing home about. Located in the so-called ‘Tooting curry corridor’ Dosa n Chutny offers an authentic Indian experience. The no-frills decor of fixed canteen tables, bright yellow spotlights and mirrored walls is unlikely to win any interior design accolades. But the exotic starters, moreish veg dishes and intensely aromatic curries will teach anybody who hasn’t visited the sub-continent that you can’t judge an Indian restaurant by its cover. 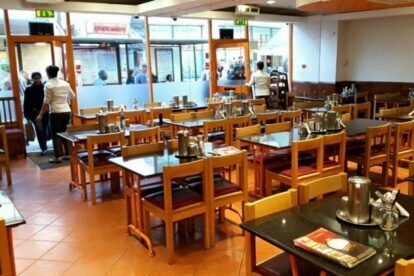 The menu focuses on South Indian dishes – such as white UFO-shaped idly rice patties or thin rice flour dosa pancakes – but there is also a varied selection of popular dishes from other culinary regions of the country. I think you’d struggle to pick a bad meal at this establishment, but after scoffing down a couple of South Indian starters I personally love to share a fragrant vegetable biryani, a smoky and creamy portion of saag aloo and a show-stopping lamb bhuna ghost. The bhuna is basically all the curry flavours you grew up with, but cooked in a fierce way you’ve never experienced before. Extinguish the exquisite spice with an ice cold beer or a fresh mango lassi.